If you have a 4mm slotter you don’t need a bearing on it to set depth of cut for biscuiting. 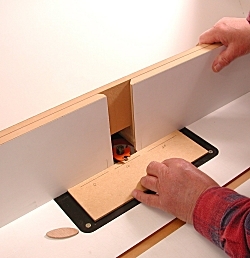 The table fence controls the depth of cut and it can be set easily and accurately with a home-made gauge. It consists simply of a rectangle of thin MDF on which three lines are drawn, one for each of the standard biscuit sizes. A few minutes’ trial and error will enable you to draw the lines accurately.